KB Theory are a fresh addition to the Brisbane music circuit. 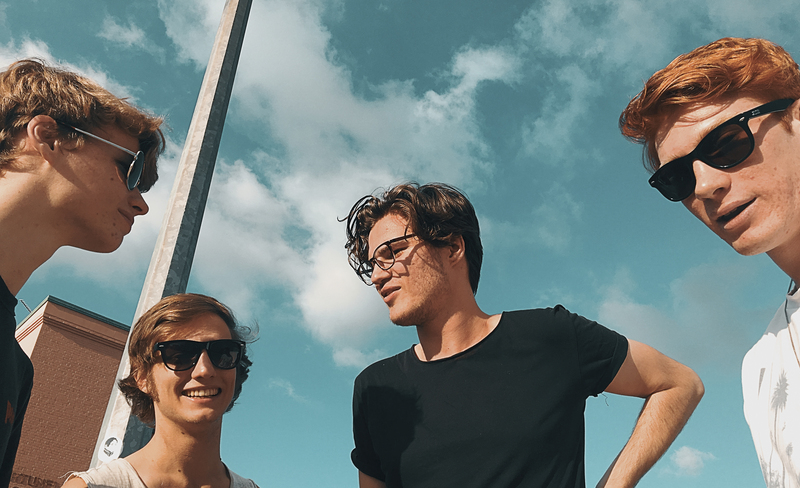 With the last band member having just turned 18 and releasing their debut single earlier this year, the band are effortlessly sharing stages with some of Queensland’s best. Taking cues from the electronic samples of The 1975, the catchy melodies of The Strokes and the indie rock of Last Dinosaurs, their new single “Hope” showcases the band’s rock background and signature splash of pop. They’re a must see, with shows all through the next few months you have no excuse not to witness this astonishing band. So for anyone just discovering your music, can you tell us a bit about yourselves? We are four guys who formed a band to make some fun and colourful music. Cam & Dylan met after high school and Andy & Harry joined much later. We are having fun experimenting with our music. Where did the name KB Theory come from? We threw around a whole host of name ideas, but the ones we wanted already had been taken. We were looking at names like One % and 6 degrees of separation. Dylan wanted Chaos Theory but when mentioning it to his uncle, he thought he said KS Theory. Dylan’s dad then said well why don’t you go for KB Theory (stands for Kevin Bacon Theory) which in effect is another way of saying 6 degrees of separation. Kevin Bacon said he’d worked with everyone in Hollywood based on the “six degrees of separation” concept, which suggests that any two people on Earth are six or fewer acquaintance links apart. We then thought ‘how cool if we could eventually say something similar, but in the music world’. What ignited your passion for music/the band? Dylan: I’ve been around music since I was young as both my dad and uncle play in live bands. There’s always been a radio playing in the house, so I grew up listening to classics on both FM & AM radio. At high school I wanted to have a go at writing a song that I wanted to hear. I’d taught myself guitar and I wanted to start writing my own stuff and that progressed to wanting to form a band. One song lead to another. After a couple of years of writing, I asked the guys to come on board. Each member has a similar story. Cam: I didn’t come from an exceptionally musical family, but my cousin and brother played guitar when we were all younger where they would always try and one up each other with what they were learning. I was significantly younger than them and never got to be part of the small musical circle in the family. I feel this definitely encouraged me to pick up an instrument, but I always felt the bass called to me more than the guitar. So I picked up my first bass when I was 13 and have been in bands ever since including cover bands and originals. But this band has been the first time where I’ve been able to push myself in terms of my playing and songwriting ability, so this band has definitely been the most creatively satisfying project I’ve been part of. Harry: I picked up guitar at around 12 inspired by James Hetfield of Metallica and quickly became addicted to learning off Youtube and tab websites. So one could say that I’m self taught but really I’ve been taught by any musician that’s hit my ears from prog legends Guthrie Govan, Tosin Abasi and John Petrucci to classical players such as Milos Karadaglic. So from hours of sweaty bedroom practice I can now play way too fast for my own good and annoy everyone in the band with my twiddling. Andy: My brother introduced me to drums when I was 5. Then, through school, I was literally in 8 bands at one time. I played a music tour through Hawaii, and another music tour through Europe for global school competitions / festivals with orchestras and the like, now I’m here. Also because my hands were too small to play saxophone, which I’m definitely 100% fine with maybe..
Each show is amazing to us as we are getting to do something we love, but our debut single launch at Black Bear Lodge was incredible in that it was our first headline show and the crowd support was phenomenal. Dylan lost his voice towards the end and the crowd stepped in to take the last chorus home. We were totally surprised that people knew the words so that made it pretty special. The venue sounds amazing and we love every opportunity we get to play there. Dylan: I’m currently listening to Gang of Youths, The 1975, Last Dinosaurs & have found Blossoms from the UK. Cam: I’m a sad boy at heart so at the moment I’ve been throwing on the album You’re Not As ____ As You Think by Sorority Noise, also Trouble Will Find Me by The National. Sadly one of my now favourite artists passed away recently and that was Scott Hutchinson from Frightened Rabbit so I’ve been listening to the album Painting of a Panic Attack a lot and forever wishing I got myself into them before his passing; such fantastic yet heart wrenching story telling. Dylan: Easy, The Sound by The 1975. It’s extremely catchy and very well written and has a lot of interesting parts in it that I wish I had come up with. Cam: I’ve always been so jealous of the song writing abilities of Matt Berninger and the Dessner twins from The National so I’m going have to say Don’t Swallow the Cap by The National. Not only do I wish I wrote this song because of how easily it flows from part to part it so accurately illustrates the sporadic movement of an anxious mind but I frequently worry that this song is the peak of all music for me and that I will never be able to write a song like that or even that another song that tops it or even comes close to it will ever be made again. Our songs are colourful, energetic & extremely tasty, just like a nice piece of salmon sushi. Whats next for you? EP, Album, tour? We are working towards an EP, but the next release will most likely be a single. Harry is currently working on some mixes now and we’re really happy with how they are turning out. What do you see for the future? Is music a long time goal or a part time passion? It’s always been a long term goal for us. We all have been involved in music in some form or another for a very long time before we came together, so music is really woven into our DNA. Our aim would be for generations of music lovers to know our music. We’re taking a different path with our music and we’re excited to see where it goes. Lastly, what’s your fondest musical memory? Dylan: I’ve had the opportunity to stand side of stage at a few gigs because of a job I was doing, and it’s a pretty special place to be. Not only are you up close and personal, you get to see the performers from a different angle and I love to watch and learn.